What would you do if you didn’t have to pack your kid’s lunch? Watch tv? Play with the kids? Go for a walk?! Love this question! This was one of my nightly dreaded activities…packing lunches. Hubby would roll his eyes and not quite understand why I hated this task so much. It is definitely an advantage to homeschooling. No preparing lunches ahead! ha! Applegate saves the day and is taking the dread out of our hands. 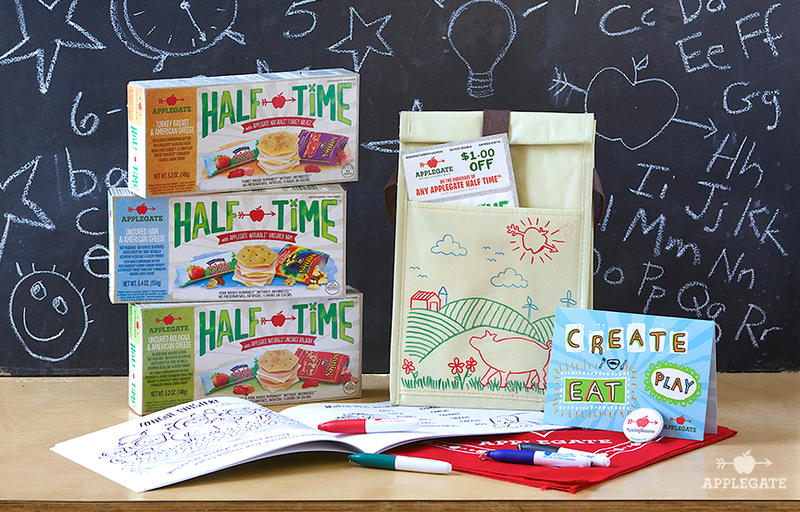 It is time to try out their brand new HALF TIME lunch kits! 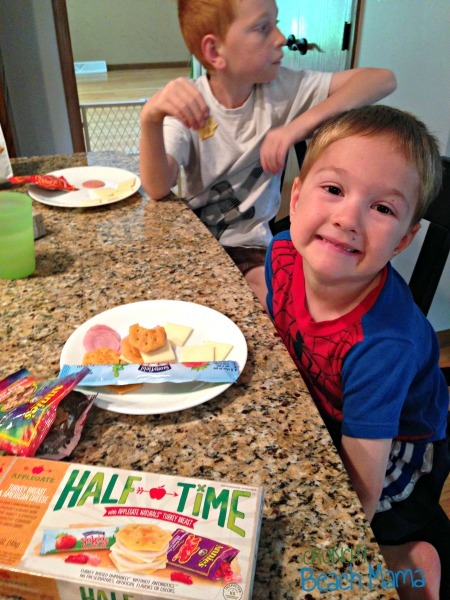 If your kids are like mine they beg for those other gross pre-packaged lunches in the grocery store. You know what I’m talking about. I will not buy them! Full of nitrates, preservatives and artificial ingredients those kits are. SO excited to find an option like HALF TIME! Thank you! 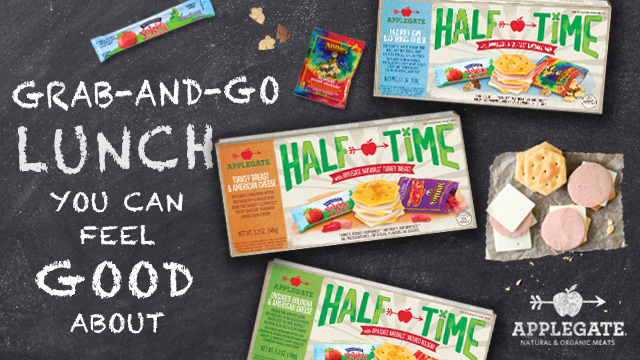 WIN this Applegate HALF TIME Prize Pack! I received these items for review for this post and all opinions are my own. The giveaway will end on Sept 29, 2014 at midnight EST. Winners will be drawn via rafflecopter. Once a winner is drawn I will contact them and they will have 48 hours to reply before I draw a new winner. Giveaway is open to anyone in the US and you must be 18 years of age or older. Giveaway not affiliated with Facebook & I release them of liability. Winner will be posted in the rafflecopter widget. I've never heard of this product, but they look like the perfect lunch for my 1st grader. This would be a great option instead of packing lunches.... if I do have to, it's usually peanut butter sandwiches, trail mix, fruit, etc. healthy stuff. I love Applegate products. I think they are a great brand. If I won these would be for my granddaughter. Her mom would probably be happy if she didn't have to pack her lunch every day. I don't pack their lunches too ofyen . Applegate s would be perfect for snacks. Relax and enjoy a cup of java!! Our kids are grown so I don't pack lunches anymore, however, these would be great for my grandkids when they visit. Thank you for the chance! I would grab a great book and relax! Well, by not making lunch at 6:20am, I have 8 more minutes to drink coffee! We have tried these and my daughter loves them. I will admit, they are a bit pricier than the "other" pre-packed lunches but I think the food quality is worth it. If I didn't have to pack lunches, I'd sleep for another 15 minutes! I'd have a second cup of coffee if I did not have to pack lunches. Thank you! i would probably pack my own! We have really healthy school lunches, so I would let my kids get school lunch. I would take a good looong shower. My husband gets the kids up and out in the mornings si mom can got in befire dawn and out early enough to pick them up. I know he'd love a few extra minutes to enjoy his breakfast. Maybe play a game or read a book to the children! I'd have a few extra minutes to cuddle even more with my kids before I sent them off to school. :) Thank you for the giveaway!! I would probably sit down for half a second if I didn't have to think about lunches! I have my kids pack their own lunches and one of them has a really hard time getting it done some nights. He would love a grab and go option. If I didn't have to make lunch for my son I would totally get some extra sleep! I would have more time in the evening to read stories with my boys. If i didn't have to pack lunch I would spend that extra time sleeping. I could use it. I would enjoy a cup of coffee while I read blogs!! There's no fruit or veggie option. And the fruit in the yogurt doesn't count because it's nutrients have been cooked to death and the yogurt itself is full of sugar. Not to mention the gummies are pure sugar. And 'natural' is a misleading term. The animals may not be given hormones or antibiotics but their feed and essentially the meat, is full of pesticides and GMO's. If you're gonna make a truly healthy lunch you gotta do the work. Shortcuts always have pitfalls. I would probably clean my kitchen. I'd catch up on reading! We'd have more time for reading extra books! Spend more time preparing a healthy breakfast! Have a few minutes to myself. I would get more sleep if I did not have to pack my sons lunch! I would be savoring my morning coffee! My child has access to a cafeteria, and is on reduced lunches, she can do that too, but I prefer packing. I would love some extra sleep! I would sleep in about 15 minutes later in the mornings. I could go to bed earlier! I think I'd have a few minutes to myself if we do it in the evening the night before, or in the morning, I'd be able to sleep a few minutes later! Not rush so much before getting my son off to school! I would make an extra cup of coffee. my sister loves lunchables so i would give this to her as a healthier version!!! she takes them to school every day. I could start my morning walk earlier. I could sleep in a little longer if I didn't have to pack lunch for my little guy.